In the late 1860s and early 1870s trade between the U.S. and China was increasing. However, a threat to this trading emerged from the unlikeliest of places; the Mexican peso. Many Chinese businesses preferred the peso to U.S. currency because the peso contained more silver than the standard U.S. dollar. This characteristic of business abroad meant that U.S. businesses had to exchange their dollars for pesos which generated costly broker fees. The government’s answer to this problem was the trade dollar. The U.S. started to mint trade dollars in 1873. The trade dollar consisted of 90% silver and weighed slightly more than the peso (420 grains vs. 416). During the first two years of production the U.S. sent nearly all the minted coins abroad to ease trade problems. Soon after, they granted the coins the status of legal tender domestically. In time, demand for the trade dollar surged. However, mining activity at home altered the course of history for the trade dollar. U.S. mines in the western regions of the country were yielding enormous amounts of silver. This influx of precious metal disrupted the supply and demand dynamics in the market. Silver prices plummeted. As a result, the trade dollar fell to an intrinsic value of just 80 cents. Soon after, the U.S. saw large amounts of trade dollars flow back into the country where Americans spent the coins at their face value. In response, Congress acted and revoked the coin’s status as legal tender in July of 1876. They continued to mint the coin, but only for the purpose of exportation. Just two years later, Treasury Secretary John Sherman ended production of the trade dollars. However, from 1879 forward, the Treasury issued proof strikes expressly for collectors. Eventually, in early 1887, legislators passed a law allowing those holding U.S. trade dollars to redeem their coins. This act brought approximately 8 million U.S. trade dollars back into the government’s hands. With the passing of the Coinage Act of 1965, trade dollars became legal tender once more. Today, the coins are highly sought after by collectors. Those dated 1884 and 1885 represent the rarest of the trade dollars. Prior to 1908, these coins were not known to exist. 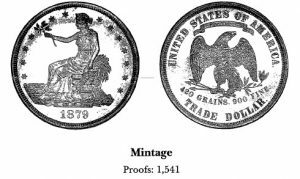 Officials and collectors learned that ten proofs dated 1884, and five proofs dated 1885 were minted. The production of these extra pieces was not recorded in official records. In 2006, a collector purchased an 1885 U.S. trade dollar in a private transaction for $3.3 million.